Anterior Head Syndrome (ANS) is a relatively new condition presenting itself in the early 2000s. Sedentary lifestyle stresses such as heads down texting, computers, gaming, and tremendous emotional stresses have stressed the muscles and ligaments to a point where they cannot adapt. 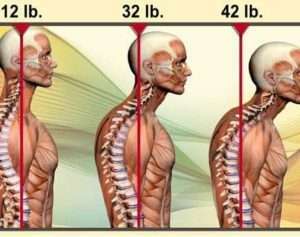 Often time this leads to misalignment of the spinal bones which creates pressure on the nerves and stretches the spinal cord. This produces significant neurologic consequences. ANS is so serious that in a recent medical study out of UCLA, men and women with hyperkyphotic spines (ANS) had an increased mortality rate. Besides an unsightly postural condition in females called Dowager’s Hump, children with weakened muscles and sedentary lifestyles are being seriously affected by this. You can self-test for ANS, but your chiropractor can only determine if it is caused by a chiropractic condition. If you suffer from Anterior Head Syndrome, please call and schedule a charge consultation to see if you qualify for care.